About The process of designing your kitchen or bathroom is supposed to be fun; however| a project that is meant to breathe new life into your home and improve the look of your décor can very quickly become a needlessly complicated hassle. Bathroom and Kitchen Remodel is here to make your home remodeling project a satisfying and rewarding experience. 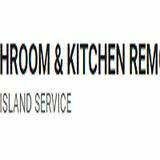 If you’re living in Suffolk County| Nassau County or anywhere else in Long Island| you can rely on our experienced and qualified professionals for all your kitchen and bath remodeling needs. Featuring the latest and highest-quality products and an unmatched commitment to customer service| we’re ready to help you give your home the update it deserves. 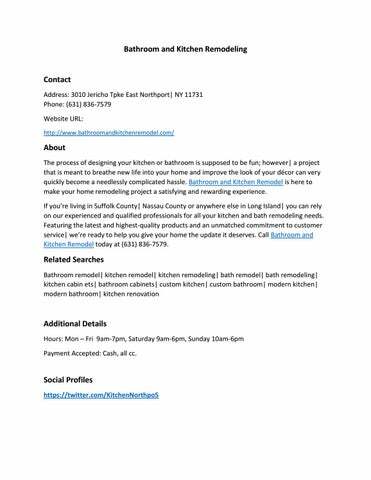 Call Bathroom and Kitchen Remodel today at (631) 836-7579. Additional Details Hours: Mon – Fri 9am-7pm, Saturday 9am-6pm, Sunday 10am-6pm Payment Accepted: Cash, all cc.